© Schoultz et al. ; Licensee Bentham Open. 11C-labeled carbamates can be obtained in a three-component coupling reaction of primary or secondary amines with CO2 and 11C-methylation reagents. [11C]Methyl-triflate mediated methylation of carbamino adducts provides the corresponding 11C-labeled carbamate groups in excellent yields under mild conditions (temperatures ≤ 40°C, 2 min reaction time). The utility of the method has been demonstrated by a highly efficient radiosynthesis of [11C]GR103545. In vivo quantification of opioid receptors (ORs) and changes in their distribution and availability in the central nervous system (CNS) following neurodegenerative diseases, substance abuse and nociceptive signaling is crucial for precise diagnosis and therapy monitoring (for review see: Henriksen and Willoch, 2008 ). Three well-defined subtypes of cerebral ORs with different functional properties are known: μ-,δ- and κ-OR (Knapp et al., 1995) , Connor and Christie, 1999) . A number of tracers have been developed for imaging of opioid receptors with positron emission tomography (PET) (Henriksen and Willoch) , Henriksen et al., 2006 , however only the δ-OR-selective [11C-methyl]naltrindole and the µ-OR-selective [11C]carfentanil depict single subclasses of the ORs in humans. 11C-labeled carbamate (-)-4-methoxycarbonyl-2-[(1-pyrrolidinylmethyl]-1-[(3,4-dichlorophenyl)acetyl-piperidine ([11C] GR103545) is a promising PET tracer for imaging of the κ-OR. Dynamic studies with [11C]GR103545 in baboons demonstrated high κ-OR affinity, excellent brain penetration, rapid uptake and wash-out kinetics, and low degree of non-specific binding (Talbot et al., 2005 ). The reported radiosynthesis of [11C]GR103545 relies on reduction of cyclotron produced [11C]carbon dioxide to form [11C]methanol, treatment with phosgene to produce [11C]methyl chloroformate, and subsequent reaction with the amine precursor to provide the 11C-labeled carbamate group (Ravert et al., 1999 ; (Ravert et al., 2002) . Unfortunately, the method provides low radiochemical yields (RCY) in the range of 2 (Talbot et al. 2005) to 14% (Ravert et al., 2002) . Together with the large variations in the specific activity obtained (2564 mCi/µmol (Ravert et al., 2002) , 150-495 mCi/µmol (Talbot et al. 2005 ), it is indicated that this method is capricious and thus effectively preventing human studies with [11C]GR103545. Here we report a new method for radiosynthesis of 11C-carbamate groups based on in situ reaction of amines with carbon dioxide and subsequent 11C-methylation of the carbamino adduct. As the method only requires a single radioactive step, the entire process of labeling, purification and product formulation can readily be carried out using an automated synthesis module. In the initial part of the study, the carbamation of benzylamine 1 was formed by reaction with CO2 in the presence of Cs2CO3 and tetrabutyl ammonium iodide (TBAI). 11C-Methylation with [11C]CH3I under conditions similar to those reported for formation of non-radioactive carbamates (Salvatore et al., 2001 ) provided carbamate 2 (Table 1) in 18-36% radiochemical yield (RCY) . 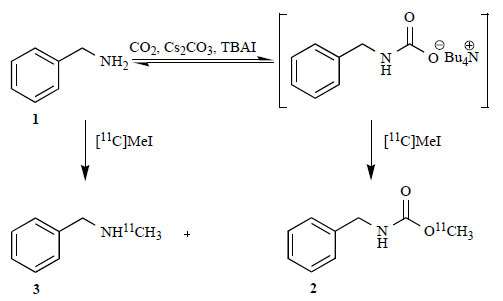 Attempts to improve the radiochemical yield by heating the reaction mixture resulted in formation of N-[11C-methyl]benzylamine (3)  in addition to the desired [11C]carbamate 2. The reduced chemoselectivity of the reaction at elevated temperature may be due to decomposition of the carbamino adduct and subsequent N-alkylation of the free amine as outlined in Scheme 1. Reaction of benzylamine with CO2 to form the carbamino adduct and alkylation with [11C]CH3I. c To a solution of benzylamine (1) (2 mg, 18.6 µmol) in anhydrous DMF (500 µl) was added 3 molar equivalents of the TBA-reagent and 3 molar equivalents of Cs2CO3. CO2 gas (20 ml/min) was bubbled through the suspension for 1 h at room temperature. The 11C-alkylating agent was swept trapped in the reaction vial and allowed to react for the desired period of time. Because of the apparent instability of the carbamino adduct at higher temperature, methylation with the more reactive [11C]methyl-triflate ([11C]CH3OTf)  was evaluated. Initial experiments with [11C]CH3OTf were performed under identical conditions to those used for alkylation with [11C]CH3I. Also in these experiments, the N-methylated side product 3 was observed when the reaction was carried out at elevated temperatures. We speculated that the large excess of iodide in the reaction mixture, resulting from addition of TBAI, may react with [11C]CH3OTf to form [11C]CH3I in situ. Substituting the phase-transfer catalyst with tetrabutyl ammonium triflate (TBAOTf) resulted in RCYs in the range of 69 ± 8 to 91 ± 5% within 2 min at 25 and 40°C, respectively (Table 1). Notably, even at 40°C the reaction provided the [11C]carbamate 2 exclusively with no formation of N-[11C-methyl]-benzylamine (3). Thus, the results suggest that the high reactivity of [11C]CH3OTf enables alkylation to proceed to completion prior to decomposition of the carbamino adduct. Using the optimized conditions for 11C-carbamate formation, des-carbamate-GR103545  was converted to [11C]GR103545 in up to 91 ± 5% RCY (Table 2). The carbamino adduct solution in DMF was found to effectively trap [11C]CH3OTf, with a volume of 100 μl sufficient to retain > 90% of the total activity introduced. Using the reduced volume (100 μl) of the precursor solution in preparative runs , [11C]GR103545 was obtained in 85 ± 6% isolated RCY, with a specific activity of 1792 ± 312 mCi/μmol and radiochemical purity of > 98%. The total synthesis time, including purification and formulation, was < 25 min after end-of-bombardment (n = 8). The short synthesis time, high specific activity and excellent RCY achieved with this method should facilitate evaluation of the κ-OR tracer [11C]GR103545 in clinical trials. b Results represent the mean ± std, n = 5.
c To a solution of des-carbamate-GR103545 (3 mg, 8.4 µmol) in anhydrous DMF (500 µl) was added 3 molar equivalents of the TBA-reagent and 3 molar equivalents of Cs2CO3. CO2 gas (20 ml/min) was bubbled through the suspension for 1 h at room temperature. Subsequently, the 11C-alkylating agent was swept trapped in the reaction vial and allowed to react for the desired period of time. [11C]MeOTf has been shown to rapidly methylate carbamino adducts of primary and secondary amines, providing the corresponding 11C-carbamate groups in excellent yields under mild conditions (temperatures ≤ 40°C, 2 min reaction time). The utility of the method has been demonstrated by a highly efficient radiosynthesis of [11C]GR103545. The method is suitable for automated routine production using synthesis modules compatible with good manufacturing practice. Henriksen G, Willoch F. Brain 2008; 131: 1171. Knapp RJ, Malatynska E, Collins N, et al. FASEB J 1995; 9: 516. Connor M, Christie MDJ. Clin Exp Pharmacol Physiol 1999; 26: 493. Henriksen G, Willoch F, Talbot PS, Wester H-J. Drug Dev Res 2006; 67: 890. Talbot PS, Narendran R, Butelman ER, et al. J Nucl Med 2005; 46: 484. Ravert HT, Mathews WB, Musachio JL, Scheffel U, Finley P, Dannals RF. Nucl Med Biol 1999; 26: 737. Ravert HT, Scheffel U, Mathews WB, Musachio JL, Dannals RF. Nucl Med Biol 2002; 29: 47. Salvatore RN, Shin SI, Nagle AS, Jung KW. J Org Chem 2001; 66: 1035. To a solution of benzylamine (1) (2 mg, 18.6 μmol) in anhydrous DMF (500 μl) was added 3 molar equivalents of the TBA-reagent and 3 molar equivalents of Cs2CO3. CO2 gas (20 ml/min) was bubbled through the suspension for 1 h at room temperature. The 11C-alkylating agent was swept trapped in the reaction vial and allowed to react for the desired period of time. Aliquots were drawn and analyzed by analytical HPLC, which was performed using either a Chromolith RP18 4.6 × 100 mm reverse phase column (Merck) eluted with acetonitrile / 0.1 M ammonium formate (27.5:72.5, V/V) mobile phase mixture at a flow rate of 5 ml/min (System A) or a Nucleosil 100 5 μm C18 4.6 × 250 mm reverse phase column (CS-Chromatographie) eluted with acetonitrile / 0.1 M ammonium formate (55:45, V/V) at a flow rate of 1 ml/min(System B). Both chromatography systems were fitted with a UV detector (Sykam Model S3210 set at 254 nm; Sykam, Fuerstenfeldbruck, Germany). For detection of radioactive compounds, a γ-ray detector (Bioscan Flow-Count fitted with a NaI(Tl) detector) was used in series with the UV detector.